The Northern and Southern Lights – What is an Aurora? For many people around the world the ability to see the Aurora Borealis or Aurora Australis is a rare treat. Unless you live north of 60° latitude (or south of -60°), or who have made the trip to tip of Chile or the Arctic Circle at least once in their lives, these fantastic light shows are something you’ve likely only read about or seen a video of. But on occasion, the “northern” and “southern lights” have reached beyond the Arctic and Antarctic Circles and dazzled people with their stunning luminescence. But what exactly are they? To put it simply, auroras are natural light displays that take place in the night sky, particularly in the Polar Regions, and which are the result of interaction in the ionosphere between the sun’s rays and Earth’s magnetic field. Basically, solar wind is periodically launched by the sun which contains clouds of plasma, charged particles that include electrons and positive ions. When they reach the Earth, they interact with the Earth’s magnetic field, which excites oxygen and nitrogen in the Earth’s upper atmosphere. During this process, ionized nitrogen atoms regain an electron, and oxygen and nitrogen atoms return from an excited state to ground state. Excitation energy is lost by the emission of a photon of light, or by collision with another atom or molecule. Different gases produce different colors of light – light emissions coming from oxygen atoms as they interact with solar radiation appear green or brownish-red, while the interaction of nitrogen atoms cause light to be emitted that appears blue or red. This dancing display of colors is what gives the Aurora its renowned beauty and sense of mystery. In northern latitudes, the effect is known as the Aurora Borealis, named after the Roman Goddess of the dawn (Aurora) and the Greek name for the north wind (Boreas). It was the French scientist Pierre Gassendi who gave them this name after first seeing them in 1621. In the southern latitudes, it is known as Aurora Australis, Australis being the Latin word for “of the south”. Auroras seen near the magnetic pole may be high overhead, but from farther away, they illuminate the northern horizon as a greenish glow or sometimes a faint red. The auroras are usually best seen in the Arctic and Antarctic because that is the location of the poles of the Earth’s magnetic field. The northern lights have had a number of names throughout history and a great deal of significance to a number of cultures. The Cree call this phenomenon the “Dance of the Spirits”, believing that the effect signaled the return of their ancestors. To the Inuit, it was believed that the spirits were those of animals. Some even believed that as the auroras danced closer to those who were watching them, that they would be enveloped and taken away to the heavens. In Europe, in the Middle Ages, the auroras were commonly believed to be a sign from God. According to the Norwegian chronicle Konungs Skuggsjá (ca. 1230 CE), the first encounter of the norðrljós (Old Norse for “northern light”) amongst the Norsemen came from Vikings returning from Greenland. The chronicler gives three possible explanations for this phenomena, which included the ocean being surrounded by vast fires, that the sun flares reached around the world to its night side, or that the glaciers could store energy so that they eventually glowed a fluorescent color. However, Earth is not the only planet in the Solar System that experiences this phenomena. They have been spotted on other Solar planets, and are most visible closer to the poles due to the longer periods of darkness and the magnetic field. For example. the Hubble Space Telescope has observed auroras on both Jupiter and Saturn – both of which have magnetic fields much stronger than Earth’s and extensive radiation belts. Uranus and Neptune have also been observed to have auroras which, same as Earth, appear to be powered by solar wind. Auroras also have been observed on the surfaces of Io, Europa, and Ganymede using the Hubble Space Telescope, not to mention Venus and Mars. Because Venus has no planetary magnetic field, Venusian auroras appear as bright and diffuse patches of varying shape and intensity, sometimes distributed across the full planetary disc. An aurora was also detected on Mars on August 14th, 2004, by the SPICAM instrument aboard Mars Express. This aurora was located at Terra Cimmeria, in the region of 177° East, 52° South, and was estimated to be quite sizable – 30 km across and 8 km high (18.5 miles across and 5 miles high). Though Mars has little magnetosphere to speak of, scientists determined that the region of the emissions corresponded to an area where the strongest magnetic field is localized on the planet. This they concluded by analyzing a map of crustal magnetic anomalies compiled with data from Mars Global Surveyor. More recently, an aurora was observed on Mars by the MAVEN mission, which captured images of the event on March 17th, 2015, just a day after an aurora was observed here on Earth. Nicknamed Mars’ “Christmas lights”, they were observed across the planet’s mid-northern latitudes and (owing to the lack of oxygen and nitrogen in Mars’ atmosphere) were likely a faint glow compared to Earth’s more vibrant display. In short, it seems that auroras are destined to happen wherever solar winds and magnetic fields coincide. But somehow, knowing this does not make them any less impressive, or diminish the power they have to inspire wonder and amazement in all those that behold them. 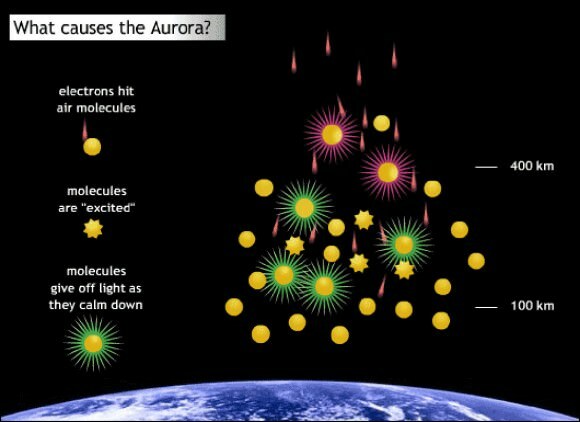 We have written many articles about Aurorae here at Universe Today. Here’s What is the Aurora Borealis?, What is the Aurora Australis?, What Causes an Aurora?, Your Guide to When, Where, and How to see the Aurora Borealis, Northern and Southern Lights are Siblings, not Twins. and See the Latest Jaw-Dropping Aurora Views from the ISS. If you’d like more info on the aurora, check out Space Weather Center, and here’s a link to some amazing Aurora Borealis pictures taken from Alaska. We’ve also recorded an episode of Astronomy Cast all about Aurora. Listen here, Episode 163: Auroras.